Still A Darn Good Spot for Breakfast in KL! 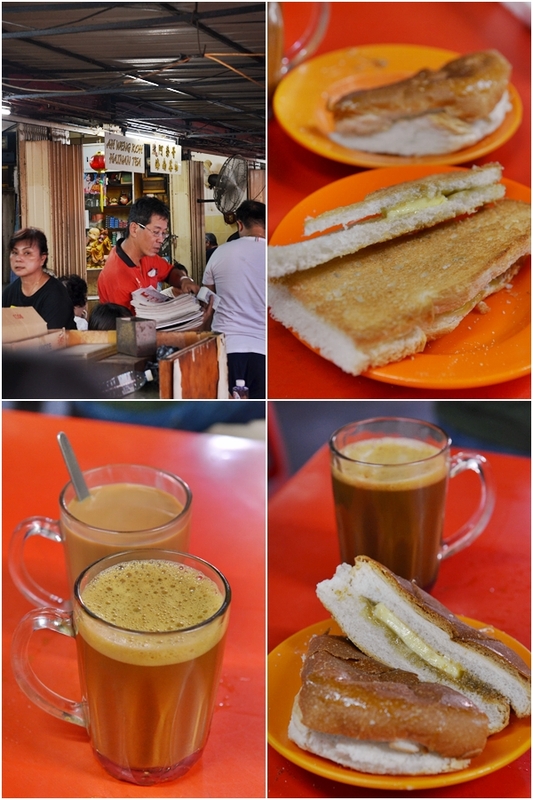 Aside from the shouts, grunts, sarcasm and heat, this Hainanese beverage stall named Ah Weng Koh Hainan Tea in Pasar Baru Bukit Bintang (Bukit Bintang New Market) still packs enough punch to be one of the BEST ‘kopitiam’ there ever was in Kuala Lumpur. And of course, the Hainan tea (a mixture of tea and coffee) is definitely one of the main draws here; aside from the ever pleasant crispy toasts with butter and homemade kaya (egg and coconut jam), or the Apollo bun (round-shaped, soft bun with a slightly burnt and crisp exterior) with the same fillings. Sadly, to pave way for the construction of the mega project; Kuala Lumpur International Financial District (KLIFD), most of the roads leading to this area have been closed temporarily since July 1st. Although the wet market and the food stalls are not affected, and judging from the morning crowd that Sunday, it was evident that support from the loyalists have never fledged one bit. But then again, there have been talks of relocating the market (it’s inevitable, as there will be no place for a wet market in the midst of a financial hub! ), yet no signs of the exact location. Or have they even shortlisted any sites yet. Anyone with news on this can kindly share with the rest of us? For one, I will miss the crazily-cramped environment sorely. The early morning camaraderie of the Hainanese owners running Ah Weng Koh tea stall shouting to one another, and sometimes at customers too! (Do not push your luck by hoarding a table for four to yourself. If you’re not in a complete party, then stand aside and wait. This writer has witnessed someone being shouted at for being selfish and hoarding the stools!). Still, in all good faith, they are still this jolly bunch of Hainanese folks. 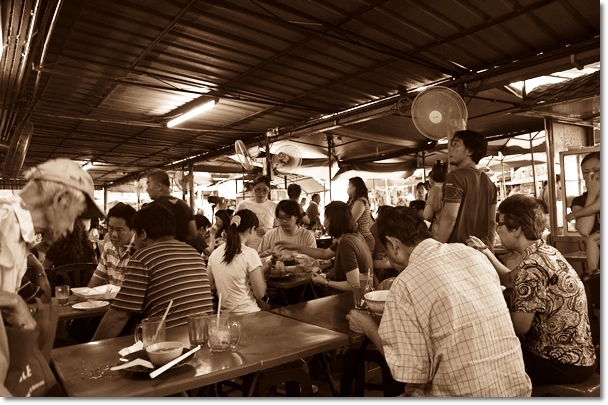 Just be aware that you’re not supposed to linger for hours (IF you can get over the warm and humid environment, that is), nor ask for a menu or recommendations. Come on …settle for their tea, coffee or ‘cham’ … better yet, go for the Hainanese coffee or tea. A mixture of both beverages into one silky smooth concoction, lightly sweetened by condensed milk and fragrant from the use of evaporated milk. For a bite, go for their toasts or steamed bread with kaya and butter. Add a half-boiled egg or two, if you will. 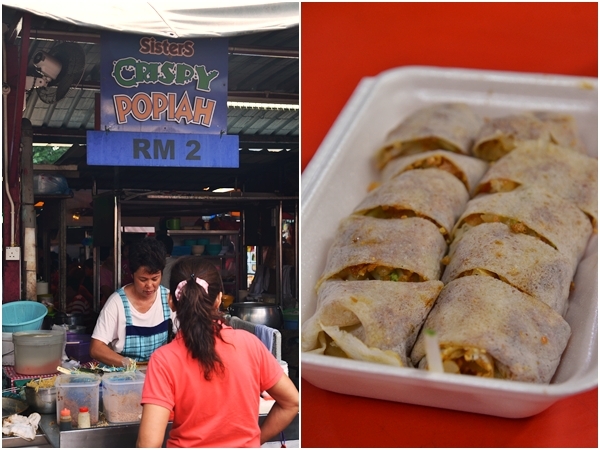 Save some space for the famous Sisters Crispy Popiah (still at only RM2 per roll) and a plate of Chee Cheong Fun from the stall named Ah Fook. Both of these stalls practise SELF-SERVICE concept, hence you will have to line up and carry your own food to the table. The pork porridge, pork noodles and wanton noodles are apparently quite delish too, yet I have not tried them before. Yeah, a sucker for the tried-and-tested route, I have never failed to stuff myself with enough toasts, buns and eggs when I was here. There are of course, various other snacks and interesting items like this old uncle (Winson Berger!) selling charcoal toasted buns sandwiching pieces of bak kwa (dried, roasted meat jerky) in between. 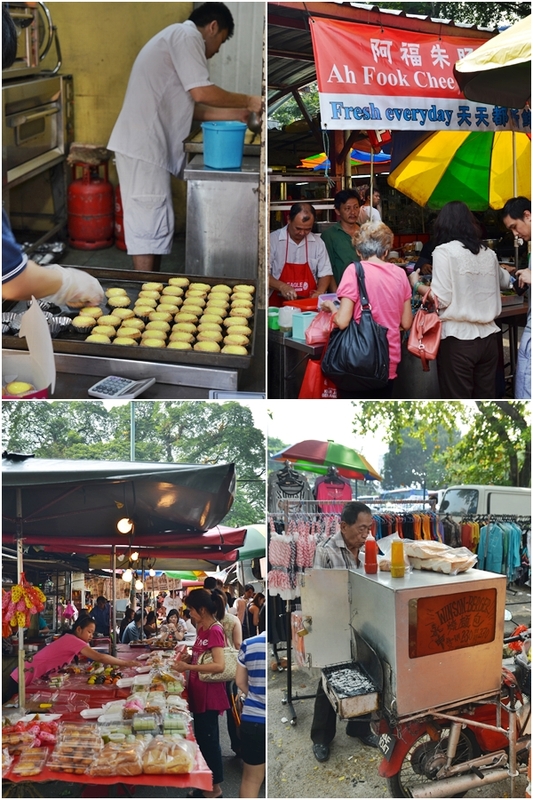 And the “Ban Chang Kueh” or “Dai Gau Min’ (apom balik) stall making them fresh on the spot for you; and you’d be ignorant enough not to notice the perfumed whiff of peanuts and caramelized sugar on the grill! And before you leave, go buy a few of the egg tarts from Bunn Choon stall next to Ah Weng Koh. Don’t forget to grab a packet of their Jiang Su biscuits too; pillowy soft biscuits that might bring you a deluge of childhood memories once you sink your teeth in! Will definitely follow them to wherever they may move the stalls to. After all, the decades of history shared between the proprietors at this market are by all means, no ordinary feat. Closed Mondays. Opens from about 6.30am onwards, until around lunch hour. They provide free sauna too. Prepare to sweat when you are there. eager to try it tomorrow..
i agree – great place for food indeed! Eii I thought the new financial district is called “Tun Razak Financial District”?